In addition to the complexities that come with installing flooring in a commercial setting, installations in healthcare environments face additional challenges. Installers and designers alike must adhere to stringent material and design stipulations due to infection control and maintenance regulations. 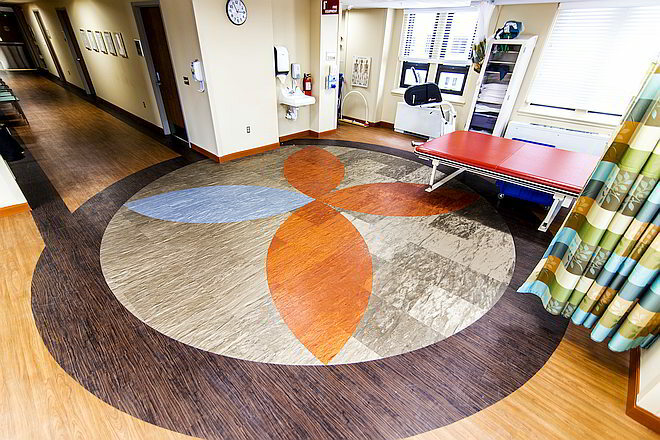 The installation team at Plymouth, Mich.-based Master Craft Flooring took these and other challenges head-on when renovating the rehabilitation clinic at the Veterans Affairs Ann Arbor Healthcare System. A government-run agency, the installation team worked with the VA’s designers to assist with the execution of installing 31,000 square feet of flooring, spanning two floors, that was not only designed to create a calm atmosphere of healing for patients, but to aid with wayfinding and navigation as well. To achieve the floors’ intricate, yet subtle patterns and designs, 11 Armstrong resilient sheet vinyl products, 12,600 feet of Tandus Centiva vinyl plank and 4,100 feet of Johnsonite rubber tile were installed to transform the VA’s flooring from a dated look to something modern yet timeless. Under the direction of Bracey and lead installer Matt Cooke, the Master Craft team worked both during and after business hours to renovate the flooring in the occupied space. Taking place in several phases, partly due to mandated government scheduling, the renovation took more than a year to complete. To learn more about the project, you can view Master Craft’s full VA Michigan case study here.